The relationship between life, death, beauty, and violence is more than complicated. 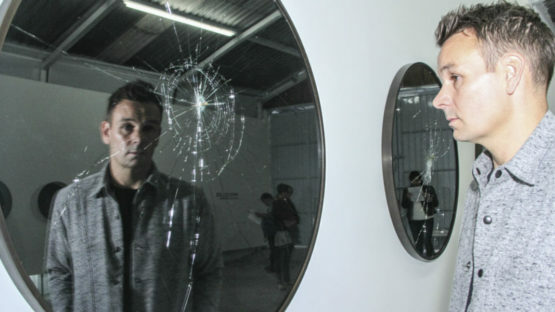 In contemporary world, where everything and everyone are over-connected, these complex relationships are the in the focus of Pryce Lee, a young and talented British artist, well known for his installations. 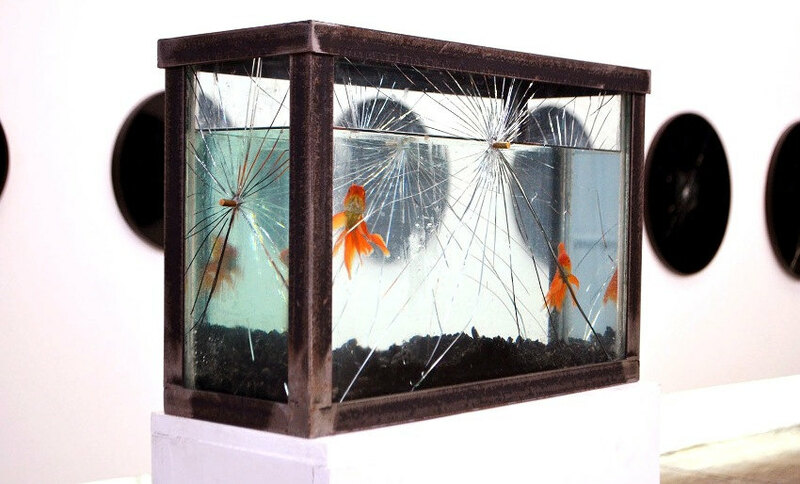 The space that exists between personal experience, social commentary, and real events is constantly explored by the artist, who works in a variety of techniques and media and creates both large-scale installations as well as individual pieces. Motion is at the center of his attention as it has the power to summon the experience that something has happened, or it’s about to. Interpretation is one of the key features of Lee’s work since he instinctively incites the viewers to read his intentions. The artist is known for working in series, culminating in all the magnificence of a solo exhibition. It provides a unique experience and opportunity for the viewers to find their own place in an open narrative provided by Lee. In Ceasefire, he explores the ambiguous and murky term, trying to find its appropriate and true meaning. The word itself has become a significant part of political parlance, while its outcomes have been all but clear. By invoking the icons of peace and war, Lee’s trying to decipher the intent hidden behind the term. 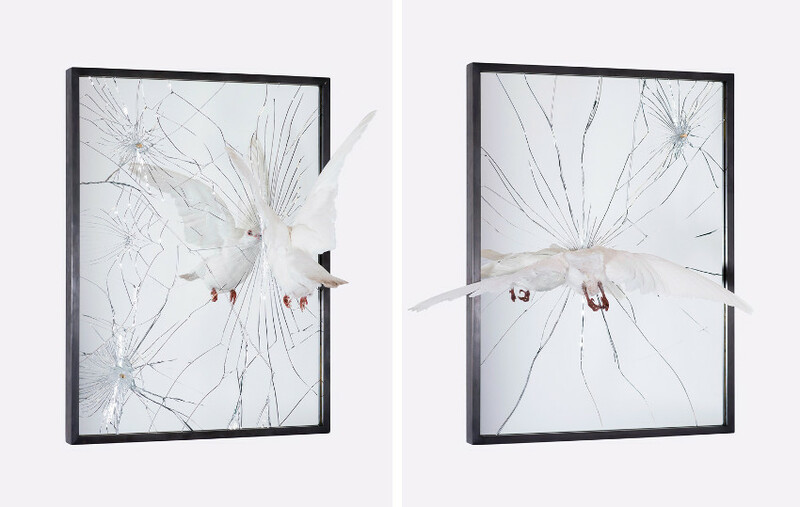 Doves, bullets, shattered glass and brass make the Ceasefire an intense exhibition of elegant chaos, while managing to keep the artist’s trademark by placing the viewers in the middle of things, provoking an emotional response. Ultimately speaking of the fine line between war and peace, the artist tackles a theme that is of utter importance for the entire world. What LIES Beneath is an exhibition that acquired its form through a pictorial appropriation of the urban landscape and the multiple realms of symbolism whose aesthetic basis is found precisely in the streets of Manhattan. Two years of research are behind the project, and the result reflects the artist’s interest in the language of construction work. 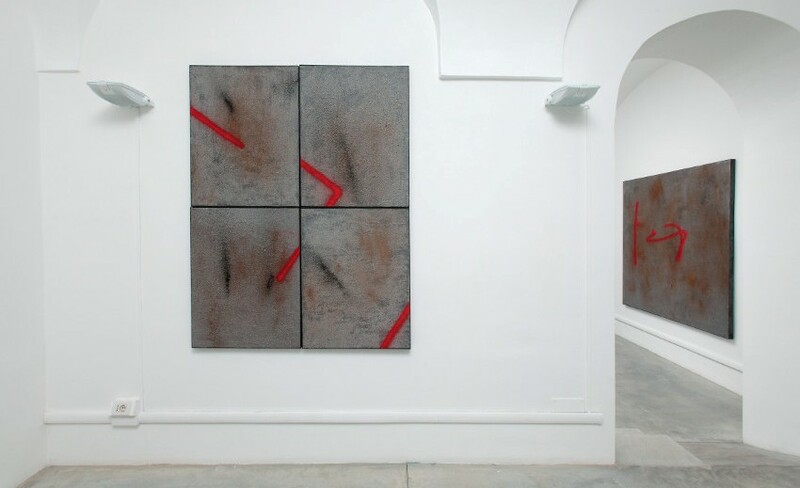 Inventing a new way for artist expression, Lee develops an original visual vocabulary by skillfully reproducing the red engineering signs sprayed on asphalt through the combination of polymers, brick dust, black sand, metal shavings and other materials on canvases. Once again, the viewers are placed in the center of a new semiotic investigation, where the artist raises a sense of metropolitan reality that has been wrongfully neglected in the past. This is a continuation of Lee’s explorations of violence, fragility, and fragmentation. Leaning on previously explored techniques, but also expanding them, this body of work creates disassociations that ripple around a moment of forceful impact by moving beyond a specific instance of violence and instead extends directly into the arena of the viewer. Lee does his best to uncover the tenuousness of life that can be easily distorted in any single instance. 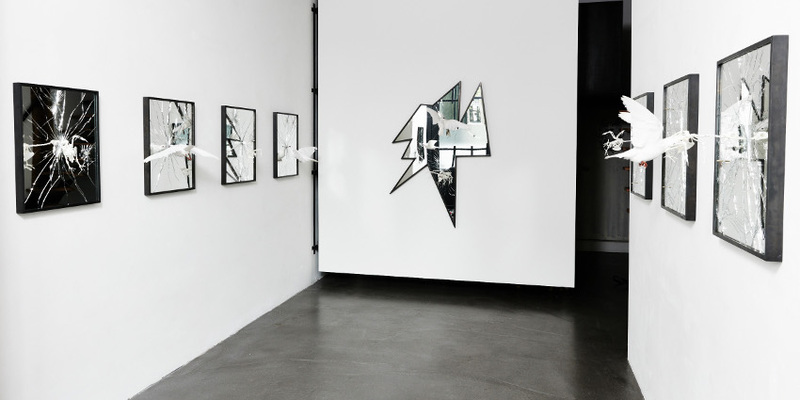 Placing his artworks within space that separate one moment from another, the artist articulates and presents many variations and consequences of anger. Fish in a Barrel is a beautifully calibrated ethereal study of destruction, existing in the threshold between a flash and its reverberations. It’s a massive installation where the reflective surface of the pieces and the delicate nature of fate capture the observer’s attention, sending a clear message – not only that we’re all targets, we’re all easy targets. Thus the name of the show – Fish in a Barrel. Lee is an artist who has no intention of telling someone how to feel. Through art, he rather provides a narrative, creating a story wide open for viewers to contemplate their position in. That level of connection between himself and his audience has become a sort of his trademark, similarly to the bullets or broken glass. Without being pretentious and trying to impose his personal opinion on the subject matter, Lee actually invites people to discuss important issues of the contemporary world. He is represented by The Garage in Amsterdam. Pryce Lee lives and works between New York City, US and Birmingham, UK.